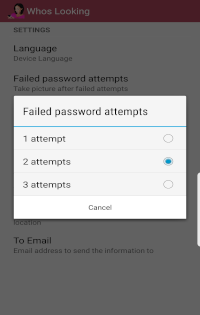 Note: Android does not count a failed attempt unless the password was more than 4 digits or 4 or more dots in a pattern. In Settings, set the number of failed password attempts you will allow before capturing picture. Photo captured and stored on your phones SD card. Optionally, users can select to have the photo emailed to them. Notification option to display W on phones status bar to indicated failed password. Click on notification or open the app to view photo of person who failed to unlock your phone. Press on the photo bar on the main screen of the app. From photo grid press on a photo to go into full image viewing. From full image viewing you can swipe the picture left or right to navigate to the other pictures. Press on the picture (some phones may have to use the menu option). This will display the options to delete or share for you to select. From photo grid view press menu button then choose 'select item'. Select the images you want to delete/share. Option to select all or unselect all is available. Once one or more images is selected, the delete and share options will appear for you to select. 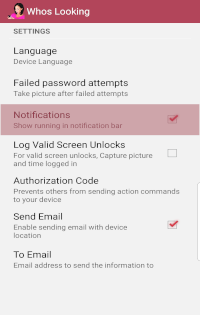 The notification feature will have a let you know Who's looking is running and when someone fails to unlock your phone the notification indicator turns red. Alerting you to a failed attempt. In Settings, check the box to enable showing notifications. A white 'W' with the text "Untouched" means Who's Looking is running and no failed unlock attempts. A red 'W' means you send a action code to your device using Cloud Locate. 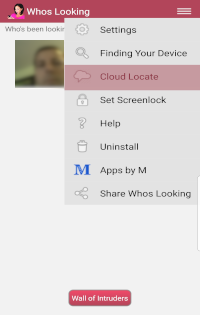 You can touch the notification to open Who's Looking to view the photo of who tried to unlock your phone. The email feature will email to you the photo of the person who failed to unlock your phone. If the phones location is available, it will be included in the email. Note: Registering for Cloud Locate will set this up for you as part of the registration process. Set Send Email, check the box to enable sending emails. Set To Email, provide a email address you want the emails sent to. Email sent with photo and phones location. The location feature will provide you with the location of your phone on a failed unlock attempt or if you lost your phone and request Who's Looking to send you a email with the phones location to assist you in finding it. Verify your phones "Location Services" are enabled. This would be in your phone settings. At least one of the services needs to be enabled. Who's Looking will check which location services you have enabled and select the one that will give the best accuracy. A link will be sent in the email with the phones location. You will also be provided with the accuracy of the location based on what the phone provided us. Note: Viewing location link from a Browser with Google maps provides better location accuracy then using the phones Google Maps app. Note: All location data is only an estimate. We do not guarantee accuracy. We are not responsible for what you do with this information. Cloud Locate will allow you to remotely send action commands to your device to ring or locate it. 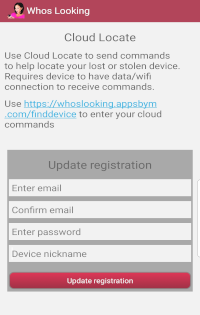 Register for Cloud Locate from the app. Use the Command Status button to check on the status of the request. This will let you know that your device received the request and is processing it. The remote ring feature will force your phone to ring at max volume no matter what it was set to. Optional - In Settings, set your authorization code. Select the Ring action command to send to your device. The remote find feature allows you to remotely have your phone email you your phones location and pictures of the location using the front and back camera to assist you in finding your lost phone. Verify you have set up the email information requested in the Email feature.